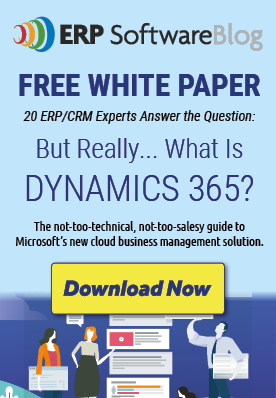 June 2, 2017 by iCepts Technology Group, Inc.
Microsoft Dynamics 365 is a business management solution that’s connecting people and processes like never before. From day one, it makes ordering, selling, invoicing, and reporting easier and faster. Turn your multiple disconnected systems into one. Boost efficiency with automated tasks and workflows—all from within familiar Office tools like Outlook, Word, and Excel. Microsoft Dynamics 365 for Sales can help you get a complete picture of your business and make better business decisions, with built-in intelligence when and where you need it. With your business running in the cloud, it’s easy to change and adapt at your own pace without involving IT. Start with what you need, quickly and easily, then be ready for growth. Contact Management: To streamline your marketing reporting, you can now specify a salesperson/purchaser code for user accounts. When you then create sales or purchase documents, the default salesperson/purchaser code is the one specified for your user account. To increase sales people's productivity in managing opportunities and to provide a more fluid experience for phone and tablet devices, you can set default chances of success in the sales cycle stages in opportunity management. Managing contact duplicates is important as contact information tends to grow over time. If you're a sales & relationship manager, your Home page now shows the number of duplicate contacts. Filter exactly which contacts you want to export from a segment and send to a marketing Agency. Dynamics 365 Integration: Connect to your Dynamics 365 for Sales solution in a few easy steps. The assisted setup helps you synchronize your data across the two apps, including sales orders, item availability, units of measure, and currencies. Prioritize leads based on revenue potential and opportunity to close through the entire sales cycle. Outlook Client Integration: Automatically pull information from Dynamics 365 for Financials to create personalized sales quotes. Sales Invoicing: Post sales right from Microsoft Outlook and email invoices as a PDF attachment that include a PayPal link to help customers make quick payments. Sales Order Management: Post sales orders to record your agreement with a customer to sell certain products on certain delivery and payment terms. Sales Pricing and Discounts: Keep track of your agreements with customers concerning discounts, prices, and payment methods. Set up special prices and sales discounts and apply discounts to sales order lines. Calculate invoice discounts automatically. The discount can differ from customer to customer with different minimum amounts (also in different currencies) and different rates, depending on the size of the invoice. The discount is calculated on the individual item lines and becomes part of the net sum of the invoice.